A PowerFilm Solar Charger is a solar panel for the rest of us. In essence, these gadgets are portable solar panels that fold up for easy transport in a backpack, in a suitcase, or, in the case of the smallest charger, in a pocket. Here’s a closer look at the chargers PowerFilm offers. 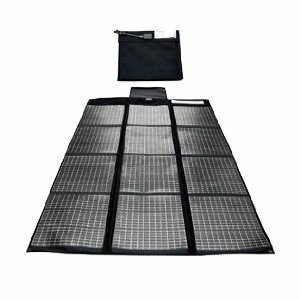 Originally created for use by the military, these foldable solar chargers are very durable and work even in low sunlight. Gadgets that are already 12V compatible may be plugged directly into the device; otherwise, get an adapter before you use it. Other types of PowerFilm chargers can be used to charge AA batteries and USB devices. F15-300N – a 5 watt panel ideal for small gadgets such as cell phones and PDAs. This model weighs in at 0.35 lbs. Unfolded it is roughly 24” x 10”; folded it is about 10” x 3” x 1”. F15-600 – a 10 watt panel best used for smaller electronic devices, but it can also charge a 12V battery and an iPhone or iPod. The weight is 0.73 lbs. The approximate unfolded size is 24” x 21”; folded is 11” x 4” x 1”. F15-1200 – a 20 watt panel, which means this device can power the items listed above, along with handheld GPS devices, digital cameras, and sat phones. The weight is 1.27 lbs. The approximate unfolded size is 30” x 32”; folded is 11” x 7” x 1”. F15-1800 – a 30 watt panel, giving you the ability to charge everything listed above, and limited ability to charge a laptop. It weighs in at 1.76 lbs. The unfolded size is 41” x 32”; folded size is 11” x 10” x 1”. F15-3600 – a 60 watt panel, meaning you can charge basically any gadget you own. It is significantly heavier than the next smallest model at 3.19 lbs. However, while its unfolded size is a whopping 59” x 43”, its folded size is still a compact 11” x 10” x 2”, small enough to fit cozily in the bottom of a suitcase. By and large, these products are receiving good reviews. It’s ideal for long cycling trips or other outdoor adventures, when you still want to use your iPod or your PDA, but you know you won’t be near any place you can plug in. For the green-conscious, it’s also a relatively inexpensive way to reduce your carbon footprint.